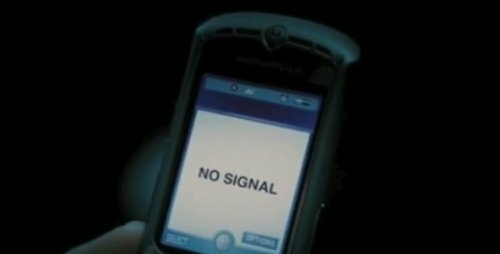 One of the things that modern horror films have to have is the “No Signal” scene. It has now become as much of a cliché as going down into the cellar one-by-one or going to a cabin in the woods. It’s a modern mainstay of the genre. an easy cop out so you can keep the action going by pretending it’s still the 1980s and horror was king. A good friend and myself were out in a public house talking about what wonderful movie we were going to watch that night. It was a Friday and the movie was Superman IV. Then it swapped to the mainstay of bad movies. The horror movie and what we need to see in every modern one. That then got us thinking. What would a horror film be like when they do have mobile coverage and social media. Would people believe you? What would our friends / followers do to help? Would they give you good advice? Would they actually believe you? Would they just think it was a “movie”? Where would you set the film? Who’s point of view would you use? The “damsel in distress”, the Internet or some of the people who are following the story? could we keep jumping around the points of view? Think of a Zombie invasion crossed with The Net. Somebody trying to convince the world that they are in peril because of an unbelievable situation. How would you convince people that this is happening in a day when it is easy to dig out photoshop and various video editing packages to churn a believable horror movie from your bedroom. Could this be a new sub-genre of horror? Modern realism? To conclude: Modern horror film writers, please embrace technology and not cowardly ignore the fact that everyone has mobile phones that can record video. If you do use the cowards way out, then why not use the phones to record footage and turn it onto a homage to The Blair Witch Project? What do you think? Would a horror movie where you are connected to the world work or are you more happy with teh “No Signal” school? This post isn’t covered by the standard, creative commons, copyright of this blog. This content is © 2014 Coyote Productions – All Rights Reserved.